King Vajiralongkorn has not made any public comments about his sister's entry into politics. Thai politics has taken many bizarre turns in recent years. The submission of King Vajiralongkorn's elder sister as a prime ministerial candidate is one of the strangest, and turns politics on its head. According to local media outlet Khaosod, the hashtag is a reference to a television show the princess appeared in, in which she jokingly said would rather hear the phrase "Long Live Slender" - a reference to her appearance - rather than "Long Live your Highness". Thailand has some of the world's toughest royal defamation laws but technically the princess is not covered by them. 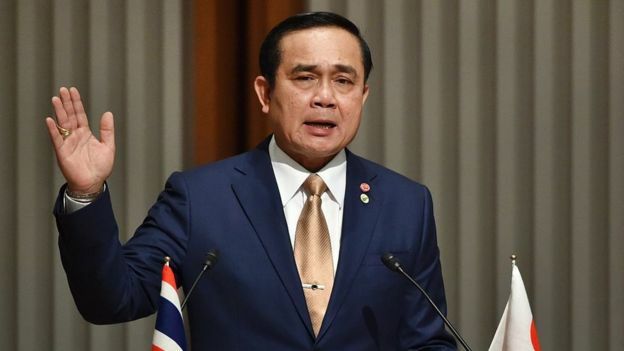 Thailand's military has a history of intervening in politics and has seized power 12 times since the end of the absolute monarchy - and the introduction of the first constitution - in 1932.